When you need long-lasting hook and loop products you can trust, turn to Paiho North America. Our expertise in hook and loop fasteners means you can get the right type of closure system for your item, whatever it is you need. Hook and loop fasteners can be used in a variety of applications, from shoes to clothing to cars to astronaut suits. Their strength and flexibility make them the ideal choice for a wide range of uses. The sky truly is the limit, and Paiho North America’s hook and loop fasteners can help make your product even better with the number of choices we have available to you. Paiho North America stocks 20 colors of hook and loop fasteners. 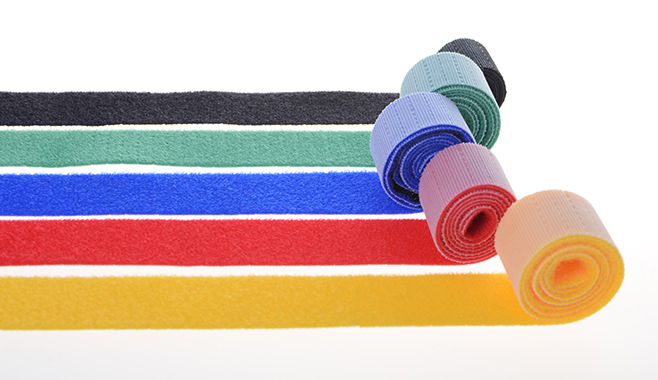 What’s more, we also can fulfill custom-order colors or even dye the fasteners to match the color of your product. Our fasteners can by sewn, glued or welded to your item. Not sure which is best for your application? Contact us to discuss your specific needs, and we can advise before you place your order. Buy just what you need, in the quantities you need it. Our flexibility throughout the ordering process makes it easy for you to do just that. You can buy hook and loop fastening tape by the roll or by the case. Or buy just the hook or just the loop. Save time. Save money. With Paiho North America’s hook and loop product options, we can be your first and only stop when you need hook and loop fasteners. Learn how we can enhance your product with our high-end hook and loop fasteners and innovative solutions. Call us toll-free at 800-328-4747 or email sales@paiho-usa.com to reach our trained customer service staff and find out which of our hook and loop products are best for your item.